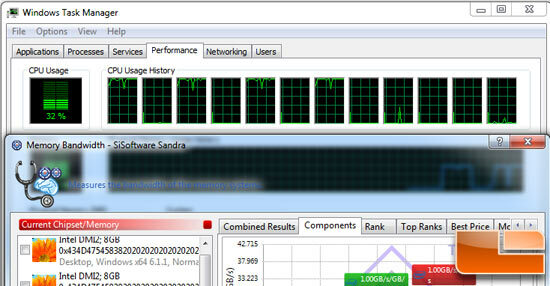 The Sisoft Sandra 2015 SP2 benchmark utility measures pretty much all of your system components, but we’ll be using it to focus on memory and CPU performance! 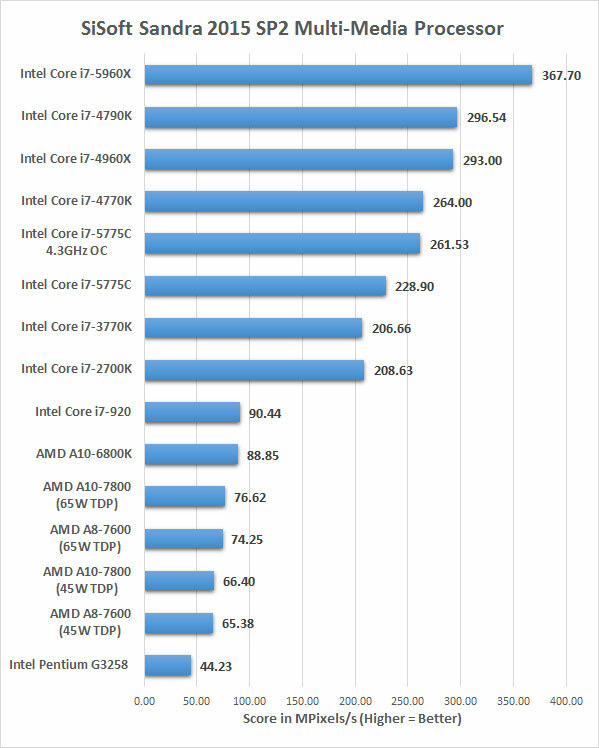 Results: As you can see from our memory testing chart above all the processors with dual channel memory kits perform roughly the same since we are using the same Corsair 2133MHz DDR3 memory kit. The Intel Core i7-5775C had 27.42 GB/s of memory bandwidth at default clock speeds and then 27.45 GB/s when overclocked to 4.3GHz. We didn’t expect any change on the memory bandwidth when we overclocked this processor as we just raised the multiplier and didn’t touch the base clock or memory divider to alter the effective memory clock frequency. Results: The Intel Core i7-5775C scored 228.90 MPixels/s in stock form and that jumped up by 14% to 261.53 MPixels/s when overclocked to 4.3 GHz on all cores. 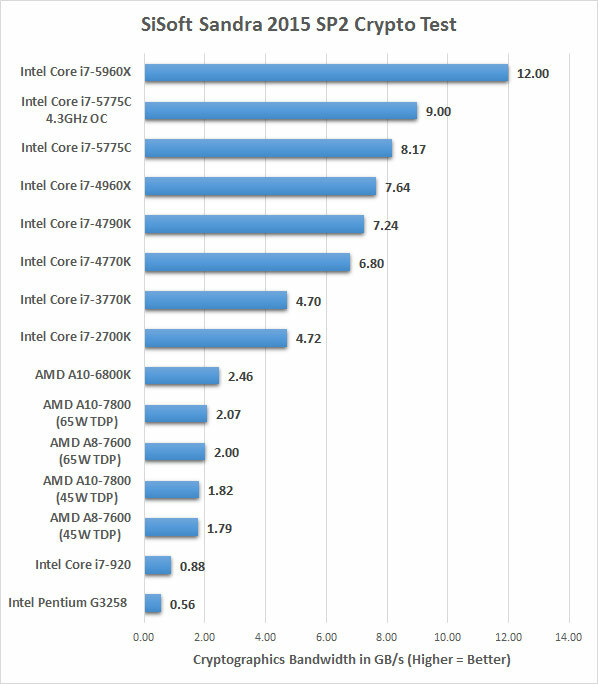 Results: All the new mainstream and high-end desktop processors support AES-NI and the Core i7 5775C scored 8.17 GB/s for this AES benchmark test, which is pretty damn good! 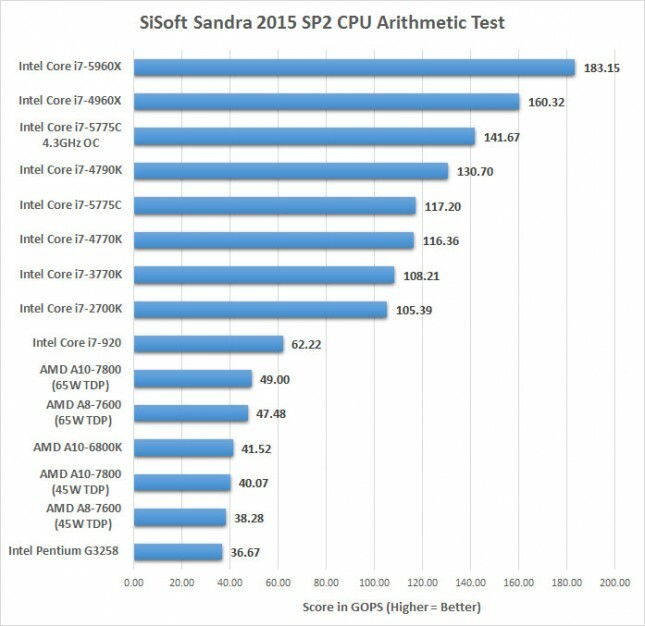 Results: In the Sandra 2015 SP2 CPU Arithmetic Benchmark the Intel Core i7-5775C Broadwell processor scored 117.20 GOPS in stock form and when overclocked we were able to get 141.67 GOPS. 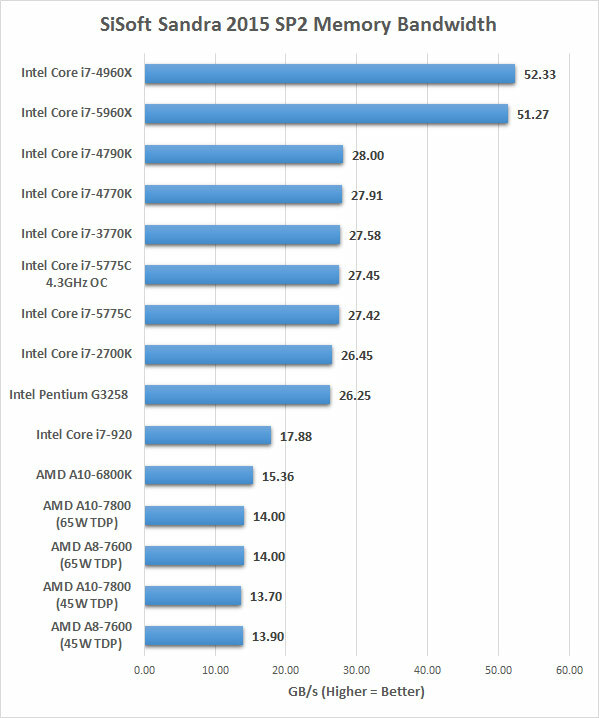 This is an improvement of 20.8% due to the overclock.